The “WR’ variety of the Seaside Daisy, also known as the Beach Aster, is an excellent choice for flower borders, parkways, mixing into meadow plantings or as a container plant. It provides a neat and formal appearance and will bloom almost year-round if spent blooms are deadheaded. The ‘WR’s lavender-blue blooms rise up above the 1’ by 2’ clumps of evergreen foliage. Plant in full sun on the coast and in full to partial sun inland. This plant tolerates salt spray, alkaline soil, wind, clay, deer and inland heat. 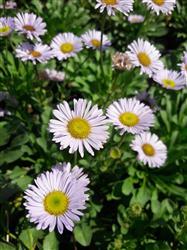 Seaside Daisy is very attractive to butterflies, bees and other native pollinators. There is some confusion between the ‘Wayne Roderick’ and ‘WR’ varieties of Beach Aster. We find that the ‘WR’ is lower growing with smaller, aster-like leaves and its flowers are held on longer stalks.